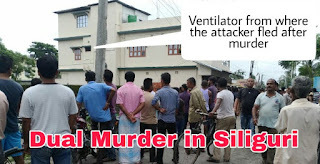 As per sources the wife of a shopkeeper and his daughter were brutually hacked to death by someone who entered their house at South Colony near Eastern Bypass under NJP outpost in Siliguri last night around 1pm. The husband who tried to stop the attacker was also brutuallly assaulted by the attacker. Locals came to know about this around 4am in the morning and alerted the police, which reached the spot and have admitted the husband in hospital in very critical state. They also have a son who got saved as he was sleeping in another room. Locals say the girls head has been smashed badly and her hands too have been severed by the attacker, meanwhile the wife neck was slashed twice, killing both of them on the spot. There were 3 people who used to work at the shop of the businessman. Sources say police have apprehended 2 of them while the 3rd is not yet traced. Huge tension prevails in the locality and people are shocked after the incident. Police is investigating into the case. 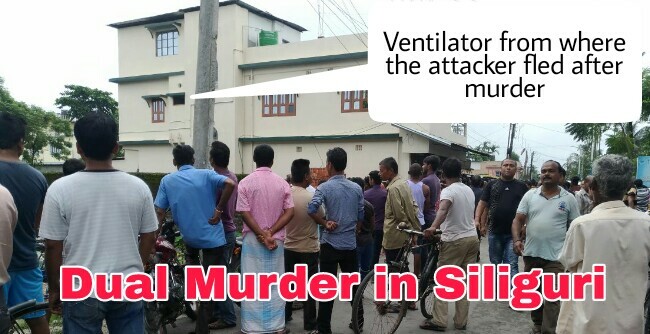 Sources say the attacker fled from the ventilator after committing the crime.